I’d never made brownies before trying these. They are now my favourite chocolate dessert. Rich and creamy from the avocado and full of protein, these treats will make you feel good. I use 90% chocolate which definitely pack a mighty kick. Blink and these babies are gone but don’t eat too many in one go if you want to sleep! Chocolate also contains a chemical called theobromine, (from the Greek Theobromo) which, interestingly, is both a stimulant and a sedative. It provides mental and physical relaxation while also delivering an energy boost similar to the effect of caffeine. I have a 9×9 inch pan so tend to use 3 avocados, an extra egg and a tad more honey and coconut flour without having to increase much else in the recipe. I prefer to melt my chocolate (with the coconut oil) in a bowl over hot water on the hob but you can melt it in the microwave by zapping for 20sec intervals and stirring in between. Avocados need to be very ripe otherwise the brownie will have a bitter after taste. But don’t worry if you find an avocado is slightly underripe. You can use a little more of your chosen natural sweetener (honey or maple syrup) and 1-2 tsp of cinnamon to mask the under-ripeness. Alternatively, I found that 1/4 tsp cayenne pepper with a dash of ginger powder also does the trick! Melt the coconut oil and baking chocolate together in double broiler or a bowl/pan on simmering water on the hob. Puree the avocados in a food processor until it is smooth and there are no lumps. With an electric mixer, beat the remaining ingredients into the batter until smooth. Grease an 8×8 pan, line with grease-proof paper and pour the batter, smoothing out the edges. Bake at 180°C for 30 mins. Cool and serve. After being handed a free bar of Divine White Chocolate with Strawberries at the rail station I decided to make use of it as a replacement for the dark chocolate in this recipe (also omit the cocoa powder). With the common ingredient recipe (i.e. 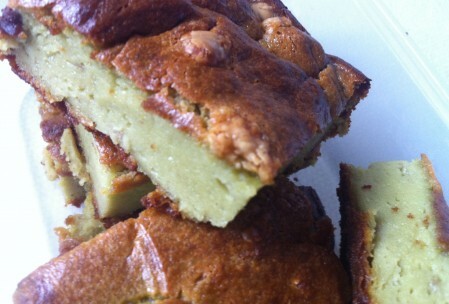 wheat flour, butter and sugar) a white chocolate brownie is called a “blondie” with avocado these blondies come out green, so I call them greenies.